People who know Darwinian evolution is biologically and genetically impossible call it myth. It is actually a hoax. Embolden by the scientific advancements made during the Age of Enlightenment, a small group of intellectuals led by Thomas Huxley were looking for an alternative to religious irrational. 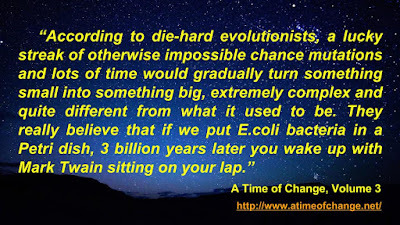 Against their better judgement they decided to use evolution as a surrogate explanation until other scientists would have found the actual scientific explanation for the origin of life. Indeed, from the beginning, the few supporters an otherwise very confused and science-challenged Darwin had were well aware there was no evidence in nature for gradualism. Later on, once some scientists figured out what was actually behind the existence of civilization Earth, at the demand of entities associated with our governments they decided to keep that reality for now a secret. The only way they could to some extent prevent that reality from being acknowledged publicly was by pretending Darwinian evolution was absolute truth, that man has evolved from apes, and that they had mountains of evidence proving that. As you are going to see in the book, nothing could be further from the truth. In fact, the mountains of evidence we have prove not only that evolution is not a real fact, but also that the scientific community, the media, the education system and our government have been deliberately perpetuated this false narrative for more than one hundred years now. One hundred and sixty years later, gradualism is the same fallacy it was when Huxley and friends coached Darwin into publishing a manuscript that otherwise was gathering dust on his desk for 23 years now. Despite that today's evolutionists continue to promote evolution as fact and it is difficult to believe they are unaware of the many problems with this theory. As a matter of principle, if their agenda is to put an end to the malefic influence religious belief has had on our civilization for thousands of years, that would be a worthy cause to take on. 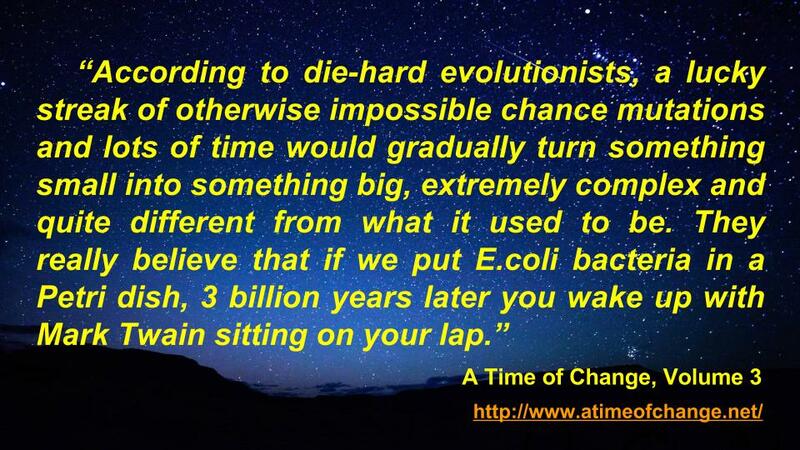 As the reader will find out, though, there is a more insidious purpose to the evolution hoax. Meanwhile, replacing a big lie with another big lie, one falsely labeled the word of god and the other falsely labeled science is far from being beneficial to our civilization. In fact, it is completely detrimental and this is what is currently preventing us from making significant advancement. A new trend these days, much to a honest unbiased observer's surprise while deists creationists with a degree in science, not necessarily the same with church creationists, have made it more than clear by the way of powerful scientific evidence the theory of evolution is pure and unadulterated nonsense, in recent years the Catholic Church, other Christian churches, some Judaic and Islamic leaders too have officially endorsed evolution and they practically hold hands with the evolutionists. In their opinion, and, as you are going to see this is what even some college science professors are inviting the public to believe, god created the world and man the way Darwin said it happened. This is not the first time religious institutions would forge an alliance of convenience with the scientific community by endorsing the official theory of the day. The church found the steady state theory promoted as indisputable fact by scientists in the first half of the 20th century to be no danger to its doctrine of creation, so it subscribed to it. Then the scientific community figured out nothing was steady in the universe, it abandoned the steady state theory, embraced the Big Bang theory as indisputable fact and so did the church. During the November 22, 1951 Pontifical Academy of Sciences meeting, pope Pius XII announced the Big Bang theory did not conflict with the Catholic Church's view on creation. As we can see, we have decades of politics associated with public declarations made by both religious institutions and scientific community. The explanation for the current alliance between church creationists and evolutionists is that promoting biblical creationism and Darwinian evolutionism as fact serves the same purpose: the preservation of the status quo, something both sides are profiting from while the government could not be any happier about that. That fake unison singing in public is meant to keep the people of the planet unaware of their true origin, and also to preserve the otherwise illegitimate authority of religious institutions. It also gives the otherwise false claim that evolution is a well-established fact made by the scientific community an appearance of credibility. You do not have to be a biologist, a geneticist or a quantum physicist to realize though gradual evolution is biologically and genetically impossible or that everything we perceive as material reality is not material or of the material. On the other hand, that creationists with a degree in science have a valid scientific argument against evolution does not mean an all-knowing god allegedly having supernatural powers created the world and everything in it, humans too. The evidence against evolution, however, is out there for all to see and analyze, and same as everybody else creationists too have access to it, so they used it because it serves their agenda. So, since they are adamant evolution is the best demonstrated theory in the history of science and that they have mountains of evidence evolution is fact, why the ad hominem attacks, the slanderous remarks, and the outright false claims about anyone, individuals with a degree in science included, who exposes the evolution hoax? There are hundreds of pages of evidence gradual evolution is a baseless assumption in A Time of Change. A few years ago, when the book was still a work in process and the manuscript was already made available free of charge online, someone copied only sentences that were conclusions reached based on that evidence, something similar to what you can read in this post, and then placed them on an one-post blog falsely stating I present no evidence for my conclusions. 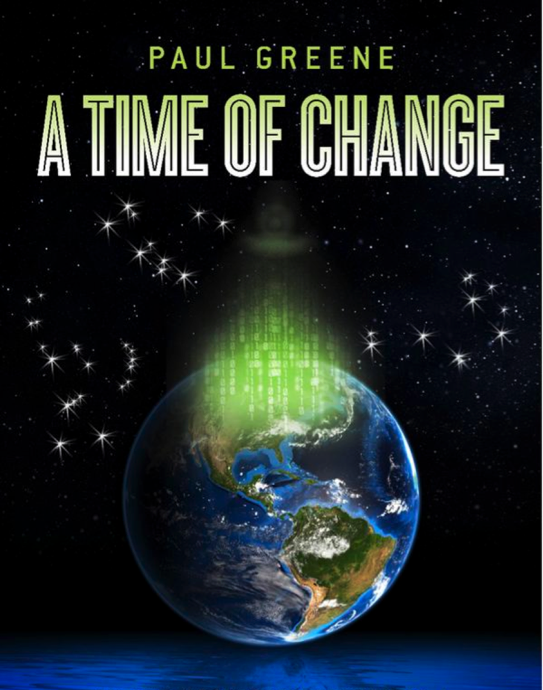 As a result, if you Google today the title of the book and my name, among others, you will get a post title saying, "Debunking Paul Greene's "A Time of Change." He claims he did, except that it is not true and since the book is much more than just about evolution, that title proves he actually did not read the book. One wonders, is this a case of someone being unable to tell reality from illusion and with no moral compass who is taking it upon himself to manipulate the public's perception of reality for a "good cause?" Considering this is far from being an isolated case, this has all the markings of deliberate, as in orchestrated acts of deception. They claim 97% of all scientists believe evolution is fact, and yet I am yet to meet a biology professor who would endorse evolution during a private conversation. What they declare in public is a different thing and that pretty much represents a submissive acceptance of the official position taken by the leadership of their academic institution, an insincere rubber stamping act rationalized by the way of appellations to self-preservation. In other words, one has to say what leadership want him to say, or otherwise no jobs for you, no book or papers published, and no book awards for you. Albert Einstein was not just a great physicist but also a philosopher. He has not once made a public comment in favor of, or against the theory of evolution for that matter, and we know he was well aware of the controversy. Same as Einstein, Richard Feynman, another prestigious theoretical physicist, he too a philosopher in his own ways is not known to have weighed in on the theory of evolution, and the question everyone should ask himself is, why the silence? In a 1996 paper published in Nature called The Tallest Tale, Stephen Jay Gould, a leading American evolutionist at the time makes actually the definitive case against gradual evolution, then within the same article he declares the theory of evolution is a solid theory. This, however, was not the only instance when he would point at evidence proving gradualism was a figment of a Darwinist's imagination. In a book called Life Itself, Francis Crick, who was awarded the 1962 Nobel Prize in Physiology for discovering the DNA, states that the DNA is not of planet Earth. It was created somewhere else, he says, and then someone brought it here. In the same book he provides page after page of definitive evidence evolution is not the explanation for the origin of life and of the species we have today on Earth. Then, similar to what Gould was often doing, in the same book he, or perhaps his editor, declares evolution capable of producing everything Crick was demonstrating earlier evolution could not produce. It is more than obvious there is a code of silence most everyone abides by. You cannot mention within the walls of an academic institution or on TV evidence debunking gradual evolution, or expose someone for making false claims on the side of evolution without risking your career or being ostracized by the scientific community. A consequence of this absurd situation, between the dogma of religion and the dogma of evolutionism and materialism we exist according to a false perception of reality, something generating the aggravated state of crisis we are experiencing today. Scientists lose credibility when they hide away facts or misinterpret evidence the public is aware of. This is why according to recent Gallup polls scientists and science journalists are getting very low grades from the American public. An indisputable fact, truth is the enemy of all belief systems, the cult of evolution included. PS: Once again, there is an abundance of evidence throughout the book in support of everything stated here more or less generically.